National Eating Disorder Awareness week is coming to an end. We have focused on the the fact that everyone knows somebody, we’ve talked about the signs and symptoms of eating disorders. I touched on how even though I knew the scary and very harmful things I was doing to my body when I was suffering, it just wasn’t enough for me to want to get help and get on the road to recovery. I would now like to wrap this very insightful and informative week with some thoughts on how you should confront a loved one if you suspect that they are suffering from an eating disorder. It can be very difficult to know what to say to someone who may not be open to getting help. You may be afraid to say anything at all, in fear that your suspicions are not true and your loved one will become upset. But please do not let those fears get in the way. You wouldn’t want to not say something and later regret it. People with eating disorders are often afraid to ask for help. They may be just as afraid as you are to talk about it. You taking the step to confront your friend may be the first step in their recovery from an eating disorder. When approaching a loved one about an eating disorder, it is important to remember to be kind, compassionate and gentle.Using threatening words and tones is not going to help. Pick a time when you can talk to your friend in private, and explain why you are concerned. Try to remain calm and positive. * Do not focus on weight and a appearance. The person is already very aware of the way they look. Telling them that they are just skin and bones is just going to reinforce their eating habits. Telling them that they look sick is going to translate to them that they look super thin. There is no need to base your conversation with them on the way they look. * Focus on feelings and relationships. not on weight and food. Talk to them about specific times when you felt concerned for them. Certain behaviors they have practiced that have you concerned. Urge them that it is important to connect their feelings to their behaviors. Why they are doing what they are doing. What feelings are inside them that they are feeling the need to cover up and push down with their eating disordered behaviors. Explain to them that their behaviors are sometimes something that may need help, and you want to be there for them and help support them in this difficult time. * Tell them you are concerned about their health. Without mentioning weight and the way they look, focus solely on their overall health. If they are sick all the time, mention that. If they have had fainting episodes, mention that. 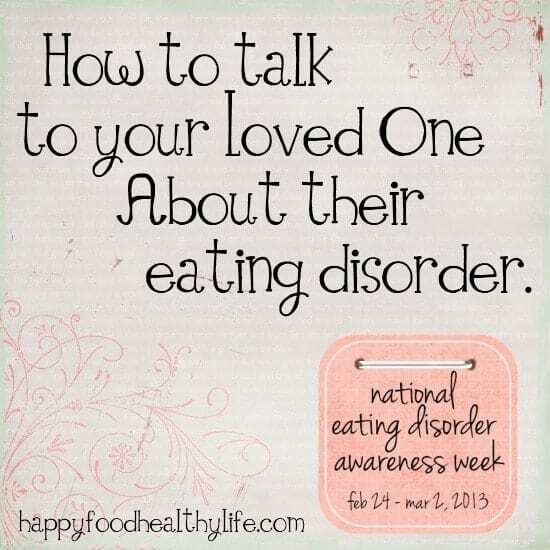 Many times, eating disorders are a cry for help, and they will most likely appreciate the concern. * Avoid power struggles over food and eating. Whatever you do, do not demand that they change their habits. Eating disordered people generally already do not feel control over their lives (at least I know I didn’t! ), and the way they find a sense of control is by controlling their eating habits. Trying to control this for them will only push them away from you. I can pretty much guarantee it. * Avoid any simple solutions. If I had a nickel for every person who told me to just eat, I would be one rich woman. “Holly, you just have to eat and then you’ll be so much better.” or “Holly, you just need to snap out of it!” I basically just rolled my eyes at every single one of them. I couldn’t expect anyone else to understand, but statements like those are just nonsense. Recovering from an eating disorder is far from simple, so offering a simple solution is really just a joke to those suffering. * Do not make them feel guilty or shameful. Statements such as, “You are scaring your father and I and we just don’t know what we’d do if we lost you,” is probably something along the lines of what you want to say. But for them to hear that is only going to make them feel guilty for not knowing how to recover. Telling them that it’s disgusting and gross when they purge their food is just going to make them feel worse about themselves. That is the last thing you want to do. * Do not give threats. Telling them that you can’t be their friend or can’t continue to be in their life if they don’t get help is not going to help. I know for me, I would just push them away because the thought of losing my eating disorder was scarier than losing many of the friends and relationships I had. Yes, I know that’s sad, but my eating disorder was my best friend. I wasn’t going to let go of it. You truly cannot force someone to get help for their eating disorder. Even if they are under the age of 18 and you think you can control them by putting them into a treatment center, but unless they are ready to change and do the real work there, it’s not going to make a difference in their overall recovery. Just remember that although you are scared for your loved one, they are probably also very scared, but also very protective of their eating disorder. They may not be ready to let go. Who knows, maybe they never will. But remind them that you will always be there for them in a loving and non-threatening way, and always urge them, in a nonjudgmental way, to seek treatment . I would also check out this article that a friend directed me to on what NOT to say to an eating disordered person. I especially like the sectioned titled “REALLY STUPID THINGS THAT PEOPLE HAVE SAID TO ME.” Kinda made me chuckle, but you know what, it happens. People don’t think when they talk to eating disordered people, but it’s not because they’re dumb. It’s because they have not been educated on eating disorders and do not understand all that goes through their heads. This is such an important topic. I was a personal trainer for many years and had to address this issue with clients or clients' families on a number of occassions. It's so difficult. Thank you for addressing this.